Prevention is the best medicine. You may not have any asthma or allergy symptoms today, but unfortunately the fumes emitted from most non green cleaning agents can cause accumulating damage. Green cleaners are fume-free & safe. You can reduce your risk of contracting asthma by 42% by using non-aerosol natural cleaners. Think about how much we pollute our planet when using toxic, petroleum-based cleaners. Now imagine millions of people using them daily. We have considered this serious environmental issue here at Kyla Kleaning. 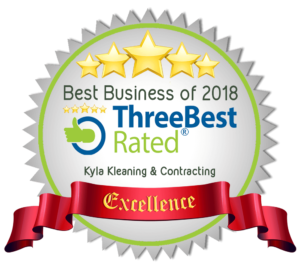 That’s why we are dedicated to providing green cleaning options for your home. Organic solvents, petroleum based waxes, naptha, ammonia, and bytol cellusolve are found in common cleaning products. These ingredients are non-renewable resources that are slow to break down in the environment and contaminate air, water and land. Research done by the World Wildlife Fund found that common cleaning products contained NPE’s (nonylphenl ethoxylates) which disrupt hormones in the body. “Hormone disrupters” are being studied as possible causes of declining sperm counts, learning disorders, hyperactivity in children, and breast, testicular and prostrate cancers. The ability for chemicals to mimic hormones as well as mutate genetic material, is a new development in research without conclusive results. Very little research has been done on chemicals in household cleaners. There is much more unknown than known about chemicals found in household products and their effect on people and the environment. There are 70,000 different synthetic chemicals in use worldwide with 1000 new chemicals added each year. Do you really want to risk the health of your family and pets? 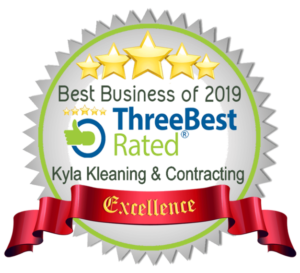 Kyla Kleaning works hard at being environmentally safe for the health of the client, the staff, the Community, the Economy, and the World Environment. So please ask us about our green option, as we make it easy for you by offering them at no additional charge.